The presence of a bear on the ski slopes forced several closures during the week and again on Monday at Lake Louise Ski Resort within Banff National Park. The bear is a well known fixture in the community, known by locals as Olivia. She has been hanging out all week, and on Monday morning returned again, the Calgary Herald reports. Out of an abundance of caution, the resort shut down the front portion of the hill. Last year, Olivia emerged with two cubs who were killed by a larger male grizzly, but this year she does not have any cubs in tow. 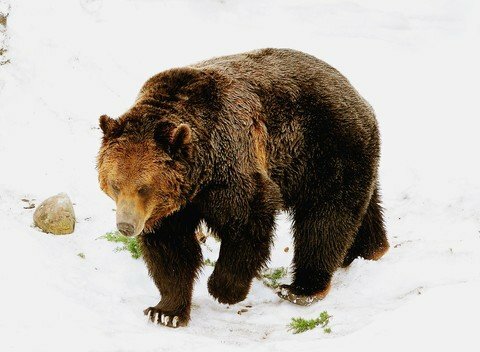 Wildlife biologists say her behavior is typical for a female grizzly this time of year, just awakening from hibernation. Officials said they would work with resort to minimize danger to guests until the resort closes on May 1. © Serjio74 | Dreamstime.com – Grizzly bear.